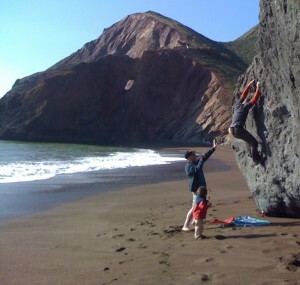 Adventure bouldering in one of the most beautiful coastal settings near San Francisco. The rock is surprisingly solid considering its you basic crappy coast strata (the waves have pummeled off the loose stuff). The best problems are TALL and a little spooky but with with great sand landings. There is also a handful of easier shorter problems. You can't just climb here any day. This area is RIGHT against the ocean so three factors must align. You need: 1) 0 or negative low tide 2) sun to dry off the holds (can only climb after noon) 3) small swell (wave height lower than 5 feet). In general, there are only a handful 2-3 hour windows each month that meet all these criteria. Chris Ewing on a V0 warm up.